We love shooting Colonial Williamsburg Engagement Sessions! There are so many beautiful places to shoot from historic homes to secret gardens and mazes. The options are endless and the atmosphere is always fun and inviting. Jon and Jenna will be getting married this coming November at the Williamsburg Inn. We will be seeing a lot of this venue this year and we are excited! As much as we love to travel, it is always the best to be close to home. We are also realizing more and more that Williamsburg is a destination wedding location for couples. This is the case for Jenna & Jon. These two sweethearts live outside of DC and pretty much all of their wedding guests will be coming from out of town. They fell in love with Williamsburg because of the history and culture and knew that it would be the perfect place for their ceremony. Spring is starting to make an appearance here in Virginia and we are definitely taking advantage of it! I am trying to ignore the rest of the forecast for the week calling for snow because I am adamant that Spring needs to come and stay for awhile! On the day of their engagement session the skies were a perfect blue. I thought for sure we would be cold, however, as we got started we quickly began to warm up. These two were all laughs and all about cuddling! I loved how they would get lost in each other and we got to the point where we would just tell them to do them because they were just so good at it! We laughed and had such a great time with the two of them. As we shot and got to know Jenna and Jon, we loved hearing all about their plans for their wedding day. Their vision is to throw and intimate affair and have a great party. As musicians they love music and they hired one amazing band… Gentlemen and Their Lady. I told them the band sounded familiar and after I looked them up I definitely remember them! Such a great band and we cannot wait to hear them again! Thank you Jon & Jenna! We loved getting to know you both and we are looking forward to celebrating with you this November! Such Models! Love this Iron Gate!! More Colonial Williamsburg Engagements Below! 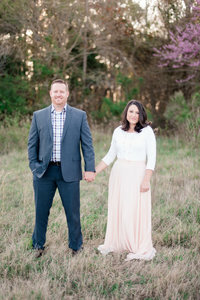 Check out these Spring Weddings!